Founded: Pleasant Valley Church, east of Goldendale. 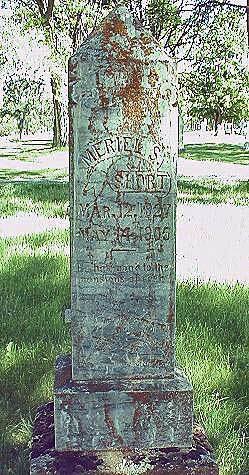 Meriel S. (Pony) Short was born to John Wesley and Avy (Amy) Short while they lived in Indiana. He was one of 11 children and may have attended the Cherry Grove Seminary near Danville, Illinois before starting overland to Oregon. He also attended another seminary. His oldest brother, Washington Short, was a preacher among the Christian Churches for 50 years. Mr. Short taught school in Marion County after arriving from the east. He was first located in the vicinity of Silverton, then later at Marion, near Jefferson, also in Marion County, Oregon. In 1859 he married Louisa, daughter of James and Eleanor Anderson, recently arrived from Missouri. Their first child, Viletta, was born in Marion. Over the years, they had nine children. In 1861, the new family moved to Klickitat County, Washington and took the first homestead in the county. Mr. Short brought with him 65 head of cattle, but most of them died in the severe winter of 1861 - 1862. From 1861 to 1866, Mr. Short operated a blacksmith shop on Columbus Road, near Maryhill. He became successful in cattle and sheep raising. Along with preaching and cattle raising, Meriel Short carried U. S. mail from The Dalles, via Columbus to a post office on Klickitat Creek. Mr. Short was saddled with the name Pony after arriving in Klickitat County. One story has it that the name came from his work of delivering the mail using a pony and another story says he was a short and robust man that in some ways resembled a pony. In 1875 he led out in establishing a Church of Christ in Pleasant Valley. After a few years, the congregation moved to Goldendale and continues there to the present. A church may have met for a while in Goodnoe Hills (about 1875), and it goes without saying that Pony Short was involved in its establishment. One early writer said that he devoted much of his time to church work. A biographer who knew Pony Short said he was "An estimable man of high character, benevolent and charitable, he commands the respect of the entire community and is held in high esteem by his wide circle of friends in Oregon and Washington." Mr. Short is buried in the Mt. View Cemetery at Goldendale, Washington. The reader can locate his name on the roster.